Minnesota Landscape Arboretum, with its 1200 acres of gardens & parks, variety of plant collection, beautiful prairies, wildlife, flowers and trailing path, is one of the best places to visit in Minneapolis. This is a place which you can visit round the year and every month and season, you will be greeted with something new and exciting. 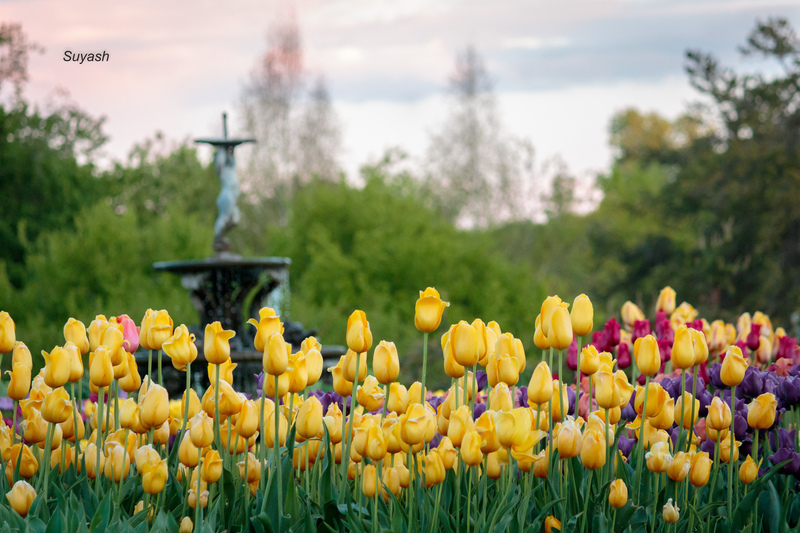 Be it fall colors, or the tulips of spring, Minnesota Arboretum draws the crowd throughout the year. It has a huge collection of garden, flowers and plantations. Two weeks back when i visited the Arboretum, tulips were at its prime in the spring. There was a large collection of tulips of various variety. 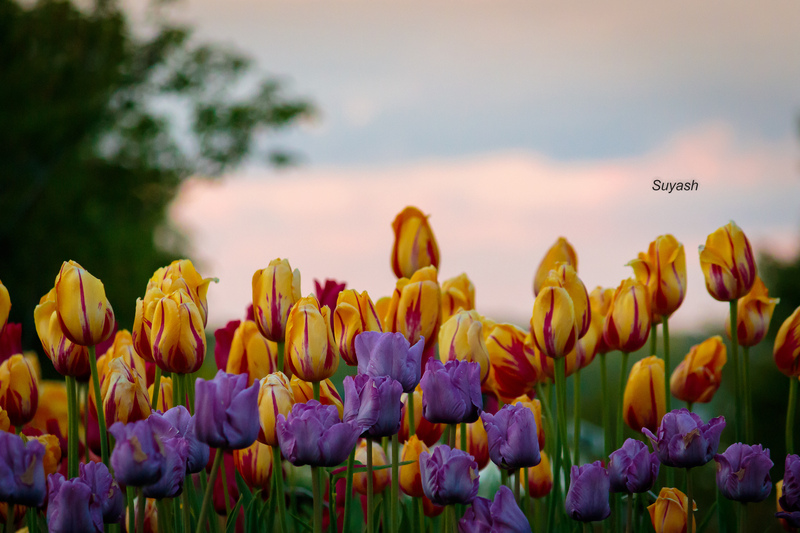 In this blog, i am presenting few photos of mine taken at the golden hour of the day displaying the grandeur and jubilant mood of tulips. Oswald Visitor center, located in the Arboretum, hosts several programs, walks and tours for all ages round the year. Andersen Horticulture Library is a great source of information for enthusiasts interested in the subject. Not only for the flower and nature lovers, Minnesota Arboretum is a wonderful place for art lovers, be it the photographers or painters. Several weddings are also planned in the Arboretum with the perfect romantic setting for the newly wed couple. Three-mile drive is the motorable road inside the Arboretum using which one can cover all the gardens and important attractions from within the comfort of a four-wheeler. One of the best thing to do on the drive is to go really slow on this drive, enjoying the nature around you. Road is shared by the bikers and pedestrians as well. There is a shuttle service as well inside the Arboretum. There are several trails which takes you to various nook and corner of the Arboretum. In case, you visit one of the trails around the evening, you might be lucky like me to be greeted by deer in the woods. Location: Minnesota Arboretum is located approximately 22 miles from the downtown in the town of Chaska. When to go: Arboretum gets its maximum footfall in the spring and fall. But you can visit any month of the year. And especially for photographers, it provides opportunities throughout the year, including the harsh winter of Minnesota. Visit here for timings. Free Admission: Throughout the year on certain days of the month, Arboretum allows free entry. This year, in 2016, there is a free entry on every third Monday of the month, noon to 6 pm, from April to October. 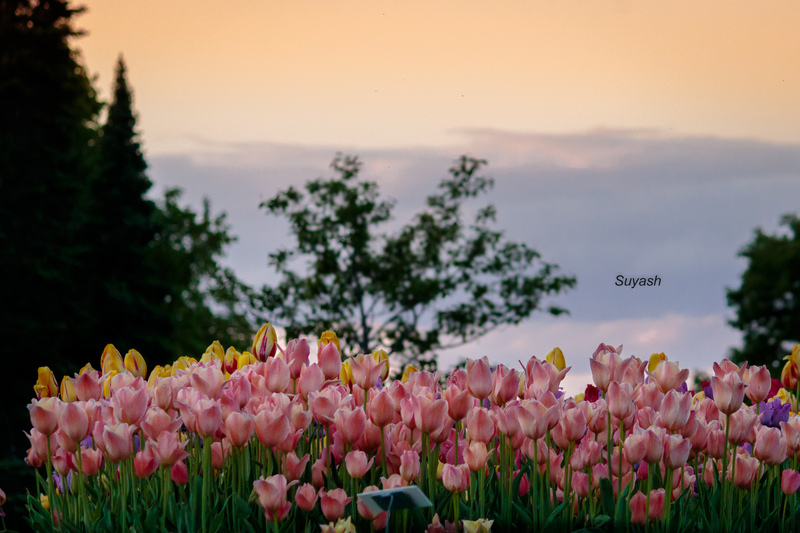 This is when i visited the Arboretum two weeks back to shoot these tulips when they were swaying with pride and jubilant in their colorful attire. Otherwise, there is a fee for visiting the Arboretum. It is free for children of and under 12 years of age. On sites like Groupon, you might find good deals on the admission ticket price and annual membership, which we made use of last fall season. This post is part of the Weekly Photo Challenge: Jubilant. This entry was posted in Nature, Photography, Sunset, Travel, USA and tagged Andersen Horticulture Library, Deals for Admission to Minnesota Arboretum, Free Entry to Minnesota Arboretum, Landscape Photography, Minneapolis, Minnesota Landscape Arboretum, Oswald Visitor Center in Minnesota Arboretum, Sunset Photography, Three Mile Drive in Minnesota Arboretum, Tulips in Golden Hour of Sunset, Tulips in Minnesota Arboretum at Sunset. Bookmark the permalink. Hi Rohan, thanks for your appreciation. You can send me an email and we can discuss on this. Thanks. Very much. I am planning to visit Arboretum next week as well coz they are free on every third Monday of the month. And what more does a photographer need!